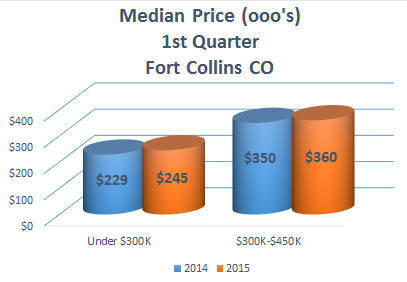 If you're thinking of selling your Northern Colorado home, now is a great time. Inventory is low, demand is high and prices are rising. If your home is properly prepared and effectively marketed, it is likely to sell quickly and for top dollar. But what are you going to do once your home is sold? That's the question that many potential sellers are struggling with. Entering this market as a buyer, you may be faced with the same low inventory, high demand and competition for homes that benefited you as a seller. This concern is probably one of the major factors contributing to the on-going low inventory situation. But if you are going to be selling a home priced under $300K, and buying a replacement home priced over that, we believe there is an interesting window of opportunity that may help your prospects. And the larger the spread between what you sell and what you buy, the better the opportunity. The data only hints at this, and our belief is based more on our subjective feel for the market and our current experiences. Demand for both price ranges is high, and prices are rising in both. But the biggest shortfall in inventory occurs at the lower prices. This is where we think we're seeing the largest appreciation rates. That effect does push upward, so home values over $300K seem to be appreciating as well - we just don't think that's happening as quickly. If we're right, that means that buying a $300K+ home now will result in good appreciation in the future. That, coupled with current low interest rates, could make moving up now an investment worth seeking out. 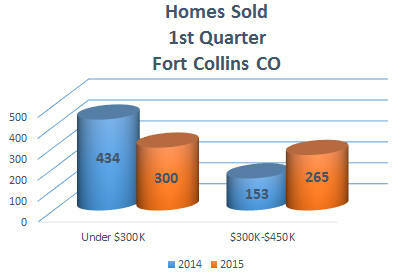 (Note: While the above charts show 1st Quarter data from Fort Collins, all of the northern Colorado markets are experiencing generally similar effects). Give us a call - We'd love to get started.